A rare survivor, it functioned as a boat building yard under the cover of its impressive girder supported canopy. Listed Grade II. The waterways that make up the present Shropshire Union Canal between Chester and Ellesmere Port were created during Britain's 'Canal Age' in the 18th century. Britain was in the midst of the Industrial Revolution. The canals offered a transport solution to poor roads and difficult stretches of river. Using a single horse a canal boat could carry heavy materials and fragile goods over long distances. Special packet boats could move passengers swiftly and comfortably compared with stage coaches. The Chester Canal was constructed in the 1770s between Chester (River Dee) and Nantwich. The Ellesmere Canal was built in the 1790s (the period of 'Canal Mania'). The Wirral Line linked Chester with the River Mersey and there were substantial modifications to the connection with the River Dee. Additional works connected Nantwich to Shropshire and the Welsh Borders and, via Wolverhampton, to the English Midlands. With the arrival of the railways the canals themselves faced competition. Steam locomotives could pull more wagons and move them faster than any canal boat. 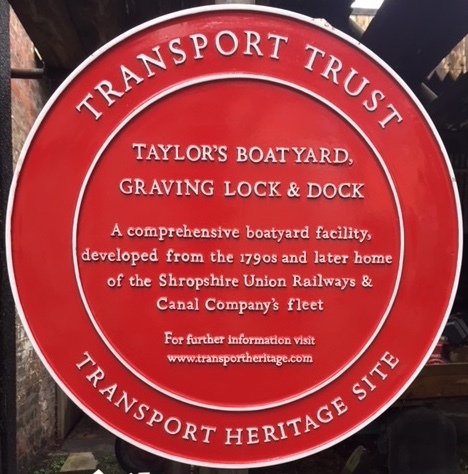 During the period of 'Railway Mania' in the 1840s the various canal systems between Wolverhampton and Ellesmere Port were merged and became known as the Shropshire Union Canal. But in the face of competition from the railways, gradual decline set in, becoming particularly evident in the 1920s. The Tower Wharf dates from the 1790s when the Wirral section of the Ellesmere Canal joined up with the existing Chester Canal. Two branches were constructed - the Main Line (to Ellesmere Port) and the Dee Branch at a lower level (a short section to the River Dee via a tidal basin). Until the arrival of the railway in 1840 a packet service took passengers (by 1801 some 15,000 per year) from Tower Wharf to Ellesmere Port en route to Liverpool. The Shropshire Union Company's head office was located at Tower Wharf until the 1920s. Located on Tower Wharf, Chester, is Taylors Boatyard. A curiosity, seen from the opposite bank of the Shropshire Union Canal. Beneath it's girdered canopy was a large boat repair and construction centre. It dates back to the 1840's and at it's height 200 people were employed on the site servicing the canal companies' fleets. Nearby is a large warehouse by Telford. By Road: Other than by boat, it is approached along the tow-path north of Telford\'s Warehouse, now a public house.